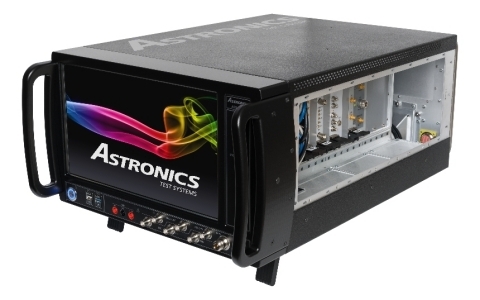 Astronics Corporation (NASDAQ: ATRO), through its wholly owned subsidiary Astronics Test Systems, announced a breakthrough concept in PXI system development: the ATS-3100 PXI Integration Platform. Astronics Corporation (NASDAQ: ATRO), through its wholly owned subsidiary Astronics Test Systems, announced a breakthrough concept in PXI system development: the ATS-3100 PXI Integration Platform. The new ATS-3100 provides a starter "system-in-a-box" for engineers to rapidly create and configure new test, measurement, or other systems based on PXI, a versatile PC-based platform for measurement and automation systems. "We've made it easier than ever before for system designers to create PXI-based solutions," said Brian Price, Vice President of Astronics Test Systems. "We're eliminating the time wasted in configuring and debugging complex cabling or the custom integration of instruments. This new platform offers a streamlined, deployable solution that does all the hard work for you. Simply plug in your instruments, install your software, and get going on producing your complete PXI system solution." "The core idea behind NI's open software and modular hardware approach is flexibility that can be harnessed by the end user," said Reggie Rector, Principal Solution Manager from National Instruments. "The ATS-3100 represents a highly integrated extension to the NI PXI platform to simplify the design and deployment of automated test systems." The ATS-3100 PXI Integration Platform saves engineers time, complexity, and non-recurring engineering (NRE) costs in developing next-generation PXI-based systems. Engineers can start with the basic set of technologies and focus time and energy on building final, polished solutions for any variety of applications such as testing, measuring, stimulating, computing, and monitoring. The ATS-3100 is a modular system, and engineers can integrate instruments from any vendor or specify instruments from Astronics Test Systems in their configuration. Available PXI instruments from Astronics include a digitizer, pulse pattern generator, waveform generator, frequency time and interval counter, rubidium, and digital test instrument. The configurable platform also "future proofs" finished test systems with the ability to upgrade instruments and software at any time. In addition to a standalone package, Astronics Test Systems will also offer the ATS-3100 PXI Integration Platform as part of a turnkey solution in which Astronics can provide the instruments and customization to create an entire system to customer requirements. Astronics Test Systems will display the new ATS-3100 PXI Integration Platform for the first time at NIWeek in Austin, Texas, from May 22-25, 2017. For complete product details and to request a quote on the new ATS-3100, visit Astronics.com. Astronics Test Systems leverages 55 years of experience to offer automatic test expertise to electronics manufacturers in the aerospace, military, semiconductor, medical, space, mass transit, and automotive industries. Astronics' test solutions ensure the world's most advanced electronic products perform as designed, every time. Astronics Corporation (NASDAQ: ATRO) is a leading supplier of advanced technologies and products to the global aerospace, defense and semiconductor industries. Astronics' products and services include advanced, high-performance electrical power generation and distribution systems, seat motion solutions, lighting and safety systems, avionics products, aircraft structures, systems certification and automated test systems. Astronics' strategy is to increase its value by developing technologies and capabilities, either internally or through acquisition, and using those capabilities to provide innovative solutions to its targeted markets and other markets where its technology can be beneficial. Through its wholly owned subsidiaries, Astronics has a reputation for high-quality designs, exceptional responsiveness, strong brand recognition and best-in-class manufacturing practices. For more information on Astronics and its products, visit www.Astronics.com. LabVIEW, National Instruments, NI, ni.com, NI TestStand and NIWeek are trademarks of National Instruments. Other product and company names listed are trademarks or trade names of their respective companies. Note to editors: Astronics Test Systems will be taking appointments to show the new ATS-3100 PXI Integration Platform to editors at NIWeek. Please contact Michelle Manson to arrange an appointment.